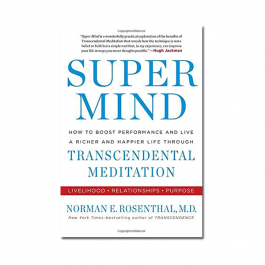 In this definitive book on the scientifically proven health and stress-relieving benefits of Transcendental Meditation, a renowned psychiatrist and researcher explores why TM works, what it can do for you, and how to use it for maximum effect. This New York Times bestselling paperback edition includes a new afterword by the author on the latest research and breakthroughs. 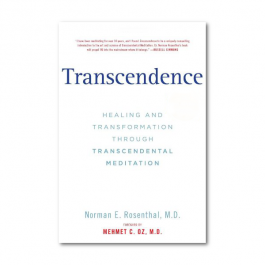 Norman E. Rosenthal, M.D., a twenty-year researcher at the National Institute of Mental Health and the celebrated psychiatrist who pioneered the study and treatment of Season Affective Disorder (SAD), brings us the most important work on Transcendental Meditation since the Maharishi Mahesh Yogi's Science of Being and Art of Living-- and one of our generation's most significant books on achieving greater physical and mental health and wellness. 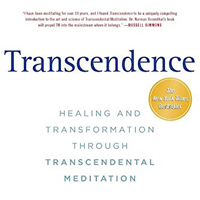 Transcendence demystifies the practice and benefits of Transcendental Meditation for a general audience who may have heard about the method but do not necessarily know what it is, how it is learned, or what they stand to gain, physically and emotionally, from achieving transcendence. Dr. Rosenthal clearly and practically explains the basic ideas behind Transcendental Meditation: It is a nonreligious practice that involves sitting comfortably for twenty minutes twice a day while using a silent mantra, or nonverbal sound, to attain a profound state of aware relaxation. Alongside exclusive celebrity interviews - where figures like Paul McCartney, Ringo Starr, Martin Scorsese, Russell Brand, Laura Dern, Moby, and David Lynch openly discuss their meditation - Dr. Rosenthal draws upon experience from the lives of his patients and a wealth of clinical research amassed on TM over the past generation (340 peer-reviewed published articles). He provides the fullest and most accessible book ever on the broad range of benefits of this remarkably simple practice, from relief of anxiety, stress and depression to new hope for those experiencing addiction, attention-deficit disorder, or post-traumatic stress disorder. Norman Rosenthal is a psychiatrist and scientist who in the 1980s first described winter depression or seasonal affective disorder (SAD), and pioneered the use of light therapy for its treatment. Rosenthal was born and educated in South Africa and moved to the United States to complete his medical training. He established a private practice and spent 20 years as a researcher at the National Institute of Mental Health (NIMH) where he studied the disorders of mood, sleep, and biological rhythms. Rosenthal's research with SAD led him to write "Winter Blues" and two other books on the topic. More recently Rosenthal has written a book on the Transcendental Meditation technique and conducted research on its potential influence on Post Traumatic Stress Disorder (PTSD). In total, he has written seven books, including one on the topic of jet lag, and published 200 scholarly papers. Publisher: Tarcherperigee - August 30, 2012.